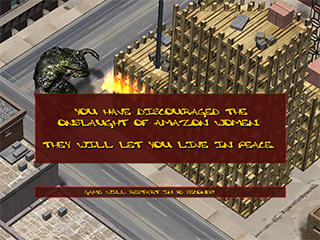 The Amazon women have left their village to collect lizard eggs for their lizard omelets. They have ventured into the big city and the hunt is afoot! Lizardman incubates his eggs in the safety of city skyscrapers and must protect his future lounge from the voracious appetites of the Amazons. *lounge: A group or congregation of lizards. A fun game with some challenges. Contact us for the full version! 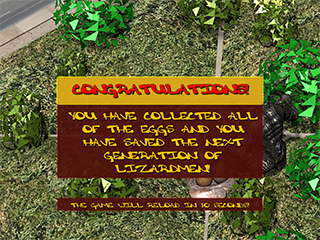 SPECIAL THANKS to ETHAN WENBERG for Lizardman, the awesome cover art and collaboration. Also, for beta-testing the PC version! Check out his animations and illustrations on his WEBSITE HERE! 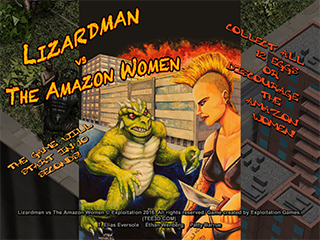 CONTENT NOT SUITABLE FOR YOUNGER AUDIENCES: features lizard monsters and knife-wielding, bikini-clad Amazon women. © 2016-2019 Exploitation Games. All Rights Reserved. Exploitation Games, Exploitationgames.com and the Exploitation Games logo are trademarks of Exploitation Games in the U.S. and/or other countries.